Beyond: Two Souls doesn’t launch until October 8, but with the demo now on the PlayStation Network, I took some time to play (and replay) what Quantic Dream had to showcase. For those that don’t know, Beyond: Two Souls centers around a woman’s life from early childhood into young adulthood named Jodie Holmes, played by Ellen Paige. Jodie’s defining characteristic is that she has a supernatural entity named Aiden, as she calls it, that follows her wherever she goes (in fact, the gameplay shows that the two of them are linked by a supernatural tether of some kind). The demo contains two separate chapters, the first being more of a tutorial on both the mechanics of playing Jodie and Aiden separately as well as a peek into the trappings of young Jodie’s now-experimental and superficial childhood. Beginning the demo, the player must walk Jodie from her staged bedroom, where she was quietly playing with her toys, to what closely resembles an interrogation room, complete with fluorescent lights and a two-way mirror. The task presented to the player is to take control of Aiden (accomplished by pressing the triangle button on the PlayStation 3 controller), fly through a wall, where on the other side is a woman with an identical set of cards that is also laid out in front of Jodie. The player must take note of which card the woman is holding, then revert control back to Jodie and select the same card on her end. Controlling Aiden works the same as a free-roaming camera found in level editing modes of other games, where the player can move freely on all three axis of the plane. Aiden’s abilities vary depending on the color of the aura that surrounds some people and objects, an aspect of the game that was clearly controlled by the game’s designers and therefore unfortunately doesn’t allow for a whole lot of freedom in regards to the possibilities a supernatural entity presents. A blue aura means that the person or object can be interacted with, usually by pushing the object or person. An orange aura, only found on people, means that the person can be possessed by Aiden, giving the player control of that person. The third and final aura shown in the demo was red and also only appeared around people. It meant, appropriately, that that person was killable, usually through asphyxiation. In many cases, controlling both Aiden and Jodie felt clunky or slow. It could be argued that this more accurately simulates the movement of an actual person, giving the body of the player character a sense of weight and space within their environment. The same was true of Quantic Dream’s last game, Heavy Rain, where moving a player was sometimes the only interaction you had with the character until the next button-prompt appeared on screen, telling you to hastily mash the X button or hold down a series of buttons in the order they appear on-screen. That core mechanic of Quantic Dream’s style of gameplay hasn’t changed much. They’ve simply added a new element (controlling Aiden) that adds a little more interactivity to the gameplay than previous Quantic Dream games have contained. Speaking of the gameplay, being so similar to past Quantic Dream games, it is easiest to derive an opinion of the gameplay in Beyond: Two Souls if one draws on their opinion of those earlier games. In short, if you liked or didn’t mind the type of gameplay that was offered by games like Heavy Rain, then you probably will enjoy playing Beyond: Two Souls. Prompts appear on screen, telling you to mash a button, push the right analog stick in a certain direction, etc. As previously stated, controlling Aiden contained none of that, in the demo at least. 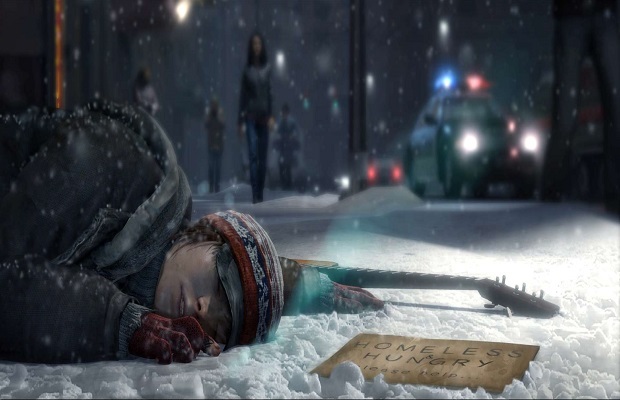 Where the heart of Beyond: Two Souls presentation lies is in the cinematic quality. Hiring two successful and arguably “big” Hollywood actors (and advertising them on the box art) was the first move Quantic Dream made in upping the ante, if you will, of their past work. From there, it can be seen that Quantic Dream has worked tirelessly to provide an even more cinematic quality to both the gameplay and cutscenes of Beyond: Two Souls through improvements to their motion capture and computer rendering/animating qualities. Unfortunately, the demo didn’t provide any more insight into the narrative aspects of the game beyond what I stated above, as it could have been a serious selling point for many considering picking it up next week. Though, much of that can be seen in the many trailers they have released thus far. Narratively speaking, Beyond: Two Souls is a Quantic Dream game, complete with branching story paths that unfortunately (in this demo) lead the player to a lot of the same story points, no matter how it was played out. For example, upon a first playthrough, I made decisions as naturally as possible and simply allowed myself to see what happened. Knowing where those decisions led, upon a second playthrough I purposely changed my decisions, yet in the end, Jodie still escaped the police and even spit out the same exact line with the same exact animations. Essentially, they just repurposed the same motion capture work on a different background. While this wouldn’t be a huge detriment to most other games, it is a little upsetting to see the player end up at the same end point, complete with reused game assets (including mo-cap work) in a game that touts its multiple branching storylines and the importance of player choice. Having now played a small portion of Beyond: Two Souls and the game’s release date less than a week away, I better understand the sort of package I can expect from Quantic Dream: one that is presented more beautifully and elegantly, but still holds the same functionality within. Should the final product surprise and offer an intelligent and interesting narrative and perhaps some critical commentary on issues it appears it wants to tackle such as abandonment, isolation, homelessness, survival, depression and suicide, then maybe there’s a lot more to Quantic Dream’s next big endeavor.